I took some close up images of flowing water at the Norris Geyser Basin in Yellowstone. 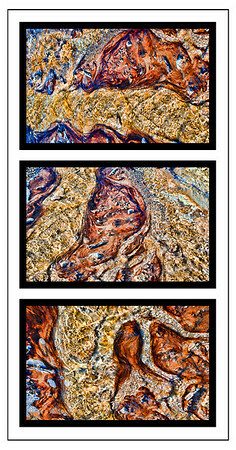 After processing, I decided I wanted to present three of the images together as they were somewhat abstract looking and this is the result. It took me awhile to figure out how to present them together. I loved the muted oranges and golds created from the minerals in the hot water. Thank you for your nice comments on my blue bird image yesterday! I appreciate them so much! Great collection of abstract images and very nicely presented. Beautiful collage, very well, done and presented. I also like the colors and textures. Yellowstone if such a wonderful place. Love this collage; great texture and color. It would look terrific framed on a wall!